The problems are being compounded by perceptions that India is ill suited to defend the currency in the near-term. The rupee breached formidable resistance of 60 to the dollar to slump to a record low on Wednesday, reinforcing the vulnerability of a country with limited reserves and struggling to narrow a record-high current account deficit. The rupee's fall in the afternoon session was swift despite a feeble attempt by the RBI to defend the currency as end-of-month dollar demand from importers triggered stop-losse s at around 60 the dollar that accelerated rupee falls. The faltering currency hit bonds and stocks as foreign investors, worried about an early end to U.S. stimulus and looking to see their returns eroded, have sold a combined net of more than $6 billion in both markets so far this month. The problems are being compounded by perceptions that India is ill suited to defend the currency in the near-term. The Reserve Bank of India has around $291 billion in currency reserves, enough for only seven months of import cover. The government has promised measures to attract foreign investment, but remains hampered by a perception that previously announced measures such as opening up the retail sector have faltered in their implementation. "The advertised reason is the CAD, but this has been purely an excuse by markets," said Suresh Kumar Ramanathan, head of regional interest rate and FX strategy at CIMB Investment Bank in Kuala Lumpur. "The real fact is that the market has attempted to take on the RBI by adding the pressure to intervene and to identify how much resolve the RBI has to defend the 60 level," he added, noting the rupee slumped once the central bank was unable to defend it. 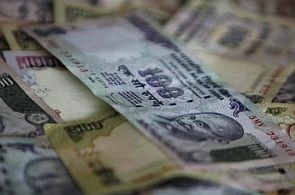 The partially convertible rupee fell to an all-time low of 60.76, breaching the previous low of 59.9850 hit on June 20. It closed trading at 60.7150/7250 versus its Tuesday close of 59.66/67. The rupee fell 1.8 per cent for the day, the worst performance of the day among emerging Asian currencies and has slumped 11.3 per cent since the start of May. India is due to post current account deficit data for the first three months of the year on Friday, and any data that shows that gap has not narrowed from a record high of 6.7 per cent of gross domestic product in the October-December quarter could spark more selling in domestic markets. For now, a cautious RBI is likely to remain the first line of defence. The RBI was seen intervening on more than one occasion on Wednesday to stem the fall, selling dollars via state-run banks, but failed to prevent a slump. The central bank has also been asking banks about the nature of flows and intraday open positions, which is being eyed by traders as a potential precursor for rules mandating a cut in speculative trades. The RBI did that in December 2011 when it mandated lenders to reduce their intraday net open positions by 50-75 per cent. "The RBI now needs to come out with administrative strictures to cut speculation, curb excessive import/foreign currency loan hedges and take oil imports out of the market," said Moses Harding, head of asset liability management at IndusInd Bank in Mumbai. The government is also due to announce measures such as opening up the telecom and defence sectors for foreign investment, adopting the same playbook in September when the country sparked a rally in markets by opening up the retail and aviation sectors to foreign investment. By contrast, promises to adopt measures have so far failed to encourage investors. Bond yields jumped on Wednesday, with the 10-year bond yield rising 8 basis points to 7.58 per cent, its highest since May 14. India's fixed income association relaxed trading bands for government bonds for Wednesday's session after some of the debt hit their upper yield circuits, dealers said. Interest rate swaps also surged with the benchmark five-year OIS rate 14 bps up at 7.44 per cent, while the one-year rate closed 10 bps higher at 7.53 percent. The BSE Sensex ended down 0.3 per cent.